The highlight of the 2016 conference was the launch of the Mark 2 TR/CIA resistivity meter which was demonstrated at the conference. 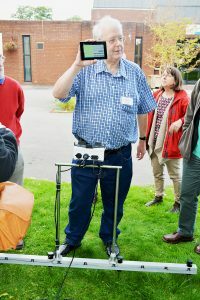 The conference was held on Saturday, 24 September 2016 with an optional second day for visits to local sites and hands-on demonstration of the new meter. The conference was held at the Poplar’s Garden Centre near Toddington (Dunstable) which is just off junction 12 of the M1 motorway. It was held in conjunction with the Ampthill and District Archaeological and Local History Society. Reception 09:30 Coffee / Tea with biscuits. AGM 09:55 AGM of the Council for Independent Archaeology. Andrew Selkirk (Chairman) 10:15 Welcome statement. Professor Steve Upex 10:25 Recent research work in Nene valley, including excavations at the Water Newton fort and the re-dating of the founding of Durobrivae. Break 11:10 Coffee / tea with biscuits. Kevan Fadden 11:55 The archaeology and resistivity surveys at Ampthill Castle. Lunch 12:40 Lunch at own expense in Poplars dining room. Adrian Farnsworth 13:50 Lidar, how to obtain it and what you can get from it. Roy Friendship-Taylor 14:30 Some Samian ware copies and other imports from Piddington Roman Villa, Northants. Andrew Selkirk 15:40 50 Years as editor of Current Archaeology – what I have learned and why Independent Archaeology is still important. Bob Randall 16:10 Launch of the new TR/CIA resistivity meter (demonstration later). Kevan Fadden 16:40 Arrangements for the Sunday. Bob Randall 16:45 Demonstration of the new TR/CIA resistivity meter. Demonstration with hands-on experience of the new meter in Ampthill Park close to the scheduled area of the Castle. An opportunity to view the park and its historic landscape. The mediaeval deer park was restyled by Capability Brown and the trees have recently been cleared to restore the views he envisaged from the Park House. This has been carried out by the Ampthill Town Council with the aid of a grant from the heritage lottery fund to celebrate the Tercentenary of Capability Brown’s birth. Meet at 10:30 in west car park of Ampthill Park. (close to junction B530/A507). Advice was given on nearby locations of archaeological and historical importance that are worth visiting.